Hi Antonio, Carol, and Paulo! 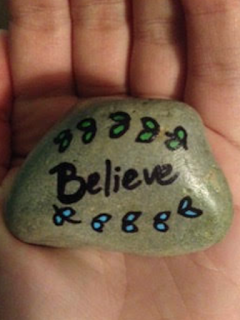 I'm from Princeton, New Jersey and I found this beautiful word rock today! I was out with a couple friends getting some lunch when we sat on a bench, and I saw it right next to me. Instantly, it brightened up my day and peaked my curiosity. I read on your website that you hope each word reaches the right person, and I have no doubt that this message was meant for me. I was raised going to church every Sunday, and so my faith has always been an integral part of my life. Recently though, I've been fairly stressed about college (I am starting in the fall) and all of the financial burdens associated with that. In turn, my faith has suffered and I've been longing for spiritual rejuvenation. The pastor who has led my church for the past 21 years retired last week, and today the new interim pastor preached. He fervently called everyone to trust fully in God and dedicate their lives to Him. Finding this rock only an hour after this sermon made me think this rock was left for me. It will be something I can bring to my dorm room to serve as a reminder to always believe; to believe in God, in His will for my life, and in myself. As a side note, I love art and would love to pay it forward by making my own word rocks. It's a simple and beautiful way to spread joy and positivity. I only wish the best for your family and all you do.